There's no questioning the importance of a pre-production Porsche. As a symbol of ingenuity and raw design, any prototype vehicle from deepest Stuttgart boasts more cultural authority than even the healthiest of mainstream 911s. But you can go one further, and it's for sale with RM Sothebys on October 27. One of many highlights to festoon RM Sotheby's Porsche 70th anniversary auction isn't a Le Mans racer, nor does it trumpet a celebrity owner. It doesn't even have a body shell. 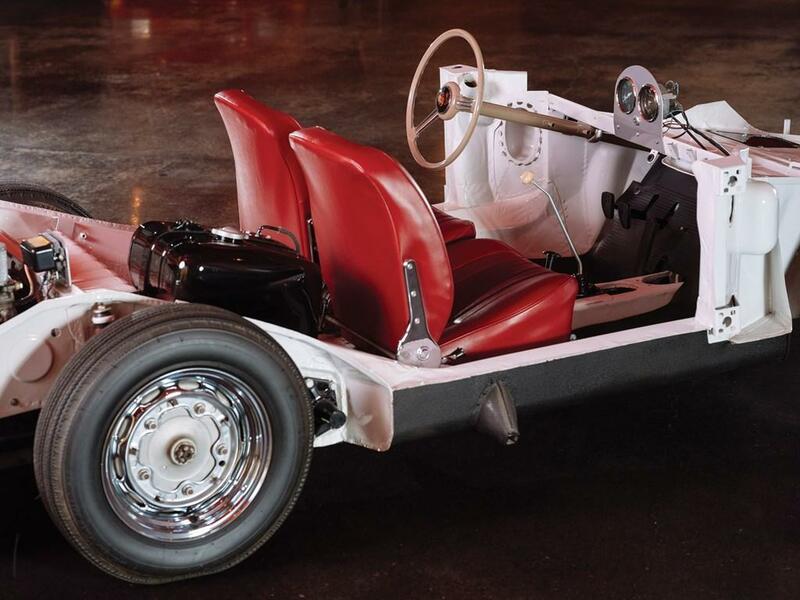 Rather, it's the original 356 A technical training chassis used by Hoffman Motors' mechanics. 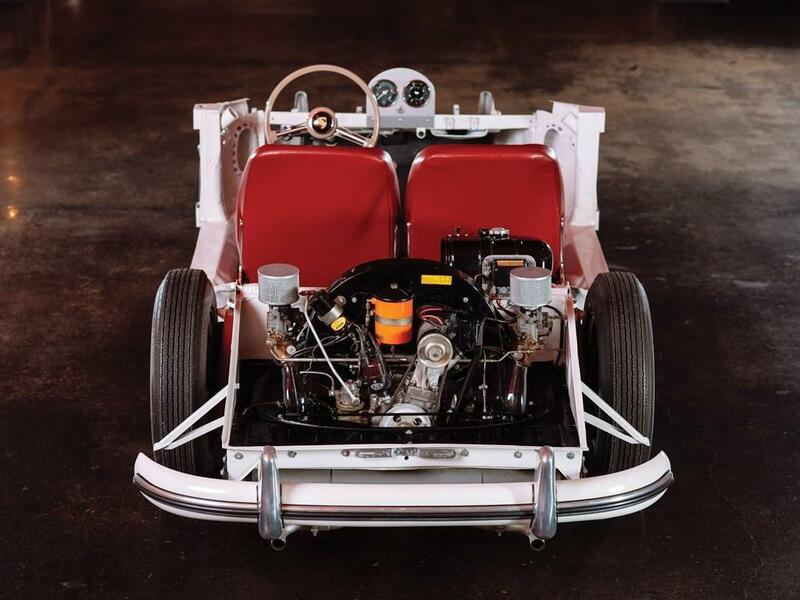 Hoffman's mechanics would tear the 356 A down to the basic chassis, painstakingly reassemble the vehicle, and then repeat the process until each mechanic had mastered their craft of returning a 356 to the road. It was, and remains, a fully functional chassis; albeit it with a unique suspension setup that differed on the left-hand side with VW-type thrusted ball bearings. The reason? To allow Hoffman's trainees to learn both Porsche's early and later designs. Following its use with Hoffman Motors, the factory training chassis was moved to Teaneck's Porsche of America headquarters in New Jersey. It was employed there until the introduction of the 356 B, rending the chassis obsolete. After several stints in storage, the training vehicle ended up in Boston, where it was then discovered by the Porsche Club of America in 1976. Residing in a chicken coop, a chap by the name of Bill Jones simply had to have it. He had admired the chassis when training in Hoffman's workshop in 1959, and had reportedly been pursuing it ever since. More than a decades' worth of renovation work followed, preserving as many of the original components are possible. It's first pubic appearance took place during the Dallas-Fort Worth Porsche Parade in the summer of 1986, before then featuring in the November 1987 edition of Porsche Panorama. The 356 A training vehicle has more recently been part of a private collection in Americana's Midwest, boasting rude health and concours condition. As a unique artefact from America's most famous Porsche distributor, steeped in history and used to educate a generation of Porsche mechanics their skills, you can't get any better. The 356 A really is the ultimate Porsche souvenir.